Thomas Javier (T.J.) Rivera graduated from Lehman High School (Bronx, NY)...Born in the Bronx on the same day the Mets captured the 1986 World Series...Played for former Met Mackey Sasser while attending junior college at Wallace Community College (AL) before attending Troy University...Made a surprise visit to his old high school on October 26, 2016 to meet the students and share his inspirational story of making to the major leagues...Delivered turkeys to Queens families in November, 2016 as part of Metsgiving...Was the Mets' 2017 Roberto Clemente Award winner...Was the 2018 Thurman Munson Award winner for contributions to the community and performance on the field...Attended New York Governor Andrew Cuomo's New York State of the State on January 4, 2018. Placed on the 10-Day Disabled List on July 28, retroactive to July 27, with a partial tear of the ulnar collateral ligament of his right elbow...Underwent surgery to repair the tear of the ulnar collateral ligament in his right elbow on September 14 in Florida...Established career-highs in home runs (five), RBI (27), doubles (13), hits (62) and games played (73) in his second season in the major leagues...Made his first career Opening Day roster...Optioned to Las Vegas (AAA) of the Pacific Coast League on April 14...Also with the Mets April 20-June 11 and June 13 until July 27...At the time of his injury, Rivera ranked among NL rookie leaders in batting average (.290, third), on-base percentage (.330, fifth), hits (62, seventh) and runs (27, ninth)...His .290 average was fifth-best among all rookies (min. 200 at-bats)...Hit his first career pinch-hit homer on June 10 at Atlanta (Game 2)...Had a career-best 11-game hitting streak from June 29-July 16...Batted .425 (17-40) with four doubles, three home runs, 10 RBI and eight runs scored during the run...It was the longest hitting streak by a Mets rookie since Juan Lagares hit safely in 12 straight games from August 25-September 7, 2013...His 11-game hitting streak was the fourth-longest by an NL rookie this season...Hit .321 (36-112) with three home runs, six doubles, 14 RBI and 12 runs scored in 32 games after being recalled from Las Vegas on June 13...Played for Puerto Rico in the 2017 World Baseball Classic...Hit two home runs and drove in five runs in eight games played... Saw action in the tournament at first base (six games), second base (one game) and third base (one game). Began the season with Las Vegas (AAA) before having his contract selected on August 10...Was optioned back to Las Vegas on August 19...Was also with the Mets from August 23-26, August 27-28 and September 6 through the remainder of the season...Made his major league debut on August 10 vs. Arizona (started at third base)...Picked up his first MLB hit, a single, off Daniel Hudson in the 10th inning on August 10 vs. Arizona...Recorded his first career RBI with a two-run double on August 14 vs. San Diego...Went 4-4 with two runs scored on August 16 at Arizona, his fifth start...Became the fourth Mets player to go 4-4 or better in one of his first five starts in the majors, joining Mike Vail (4-4 in his third start in 1975), Josh Thole (4-4 in his fifth start in 2009) and Michael Conforto, who was 4-4 in his second start in 2015...Went 3-4 on September 13 at Washington...Hit his first career major league homer in the 10th inning to give the Mets the win...According to Elias, the last Met to hit their first career homer in extra innings was Lastings Milledge June 4, 2006 at San Francisco...His three RBI were a career-high...Additionally, Rivera became the sixth Met whose first career homer was a go-ahead home run in the 10th inning or later...The other five are Steve Henderson (1977), Brian Giles (1982), Melvin Mora (2000), Esix Snead (2002) and Craig Brazell (2004)...Research courtesy of Elias...Became the first Mets rookie to homer in consecutive games (September 18-19) since Jordany Valdespin homered July 6-7, 2012...Batted .369 (24-65) with two doubles, one triple, three home runs, 13 RBI and seven runs scored in his final 18 games of the season...Won the Pacific Coast League batting title with his .353 (143-405) average for Las Vegas, edging teammate Brandon Nimmo (.352)...Finished third in the PCL in on-base percentage (.393) and had the fourth-lowest strikeouts per plate appearance ratio in the league (one strikeout every 8.19 plate appearances)...Was the Sterling Award winner at Vegas, emblematic of the Most Valuable Player on his 51s team...Named to the PCL mid-season All-Star team...Also was the PCL Player of the Month for May. Started at second base in the NL Wild Card Game vs. San Francisco and had the team's only extrabase hit (double). Led all qualifying Mets minor leaguers with his .349 combined batting average (158-453)...Selected to the Florida State League midseason All-Star team. Selected to the Florida State League midseason All-Star squad. Named to the South Atlantic League midseason All-Star team. March 9, 2019 New York Mets released 3B T.J. Rivera. 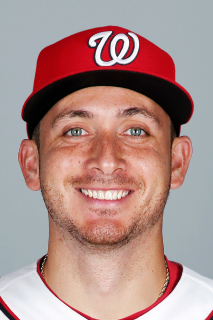 November 14, 2018 3B T.J. Rivera assigned to Indios de Mayaguez. November 2, 2018 New York Mets activated 3B T.J. Rivera from the 60-day disabled list. July 13, 2018 New York Mets sent 2B T.J. Rivera on a rehab assignment to Las Vegas 51s. July 5, 2018 New York Mets sent 2B T.J. Rivera on a rehab assignment to St. Lucie Mets. February 18, 2018 New York Mets placed 3B T.J. Rivera on the 60-day disabled list. Tommy John surgery. October 2, 2017 New York Mets activated 3B T.J. Rivera from the 10-day disabled list. July 28, 2017 New York Mets placed 3B T.J. Rivera on the 10-day disabled list retroactive to July 27, 2017. Partial tear of the ulnar collateral ligament in right elbow. June 13, 2017 New York Mets recalled 1B T.J. Rivera from Las Vegas 51s. June 11, 2017 New York Mets optioned 1B T.J. Rivera to Las Vegas 51s. April 21, 2017 New York Mets recalled T.J. Rivera from Las Vegas 51s. April 14, 2017 New York Mets optioned 2B T.J. Rivera to Las Vegas 51s. March 30, 2017 SS T.J. Rivera assigned to Las Vegas 51s. September 6, 2016 New York Mets recalled T.J. Rivera from Las Vegas 51s. August 29, 2016 New York Mets optioned 3B T.J. Rivera to Las Vegas 51s. August 27, 2016 New York Mets recalled T.J. Rivera from Las Vegas 51s. August 26, 2016 New York Mets optioned 3B T.J. Rivera to Las Vegas 51s. August 23, 2016 New York Mets recalled T.J. Rivera from Las Vegas 51s. August 19, 2016 New York Mets optioned 3B T.J. Rivera to Las Vegas 51s. August 10, 2016 New York Mets selected the contract of T.J. Rivera from Las Vegas 51s. June 28, 2016 T.J. Rivera roster status changed by Las Vegas 51s. June 16, 2016 Las Vegas 51s placed SS T.J. Rivera on the 7-day disabled list. April 3, 2016 SS T.J. Rivera assigned to Las Vegas 51s from Binghamton Mets. February 17, 2016 New York Mets invited non-roster SS T.J. Rivera to spring training. January 30, 2016 SS T.J. Rivera assigned to Puerto Rico. August 1, 2015 SS T.J. Rivera assigned to Binghamton Mets from Las Vegas 51s. July 11, 2015 Las Vegas 51s activated SS T.J. Rivera from the 7-day disabled list. July 6, 2015 Las Vegas 51s placed SS T.J. Rivera on the 7-day disabled list retroactive to July 4, 2015. May 16, 2015 SS T.J. Rivera assigned to Las Vegas 51s from Binghamton Mets. May 2, 2015 Binghamton Mets activated SS T.J. Rivera from the 7-day disabled list. March 16, 2015 IF T.J. Rivera assigned to New York Mets. June 30, 2014 Binghamton Mets activated SS T.J. Rivera from the 7-day disabled list. June 19, 2014 2B T.J. Rivera assigned to Binghamton Mets from St. Lucie Mets. March 16, 2014 IF T.J. Rivera assigned to New York Mets. November 7, 2012 SS T.J. Rivera assigned to Indios de Mayaguez. November 7, 2012 Indios de Mayaguez placed SS T.J. Rivera on the reserve list. November 7, 2012 Indios de Mayaguez activated SS T.J. Rivera. June 21, 2012 2B T.J. Rivera assigned to St. Lucie Mets from Savannah Sand Gnats. April 4, 2012 T.J. Rivera assigned to Savannah Sand Gnats from Brooklyn Cyclones. August 6, 2011 T.J. Rivera assigned to Brooklyn Cyclones from Kingsport Mets. June 20, 2011 T.J. Rivera assigned to Kingsport Mets. June 15, 2011 New York Mets signed free agent SS T.J. Rivera to a minor league contract.